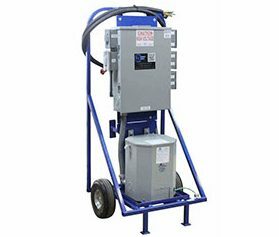 by Brianna Crandall — February 6, 2019 — Larson Electronics, a Texas-based company with over 40 years of experience spearheading industrial lighting and industrial equipment, just announced the release of a temporary power distribution system that can convert 480V AC current to single-phase 120V AC and 240V AC 60Hz. Operators can safely tap into and distribute 480V AC power from generators and direct grid power with this unit, allowing it to be used indoors and outdoors, says the company. The MGL-25-480.3P-1X480.50A-4X120.20A-2X240.50A temporary power distribution system converts three-phase, 480V AC to single-phase 120V AC and 240V AC through a 25 kVA transformer. This unit is equipped with 10 feet of #2 3/4 SOOW line-in cable to connect the substation to a primary 480V primary power supply. A 125A main breaker panel uses 480V primary voltage and provides a single 50-amp CS8169 receptacle with a waterproof cover protected by a 50-amp breaker that feeds the 480/120 – 240V transformer that is protected by a 60-amp breaker. Larson Electronics’ power distribution station has a secondary side that is wired to a 120/240V single-phase, 100-amp load center with a main breaker for protection. This unit features 120/240V line-out protection that is provided through four 20-amp, 125V, single-pole breakers and two 50-amp, 250V, two-pole breakers. The load center for this unit is rated NEMA 3R and is mounted to a powder-coated steel dolly-cart-style frame with two run-flat rubber tires. Suitable applications include use at construction sites, plant maintenance and turnarounds, and more. For more about the new temporary power distribution system, or the company’s other industry-grade lighting and power distribution products, visit the Larson Electronics website.